The CBM 3xxx and 4xxx series were revisions of the original PET 2001. 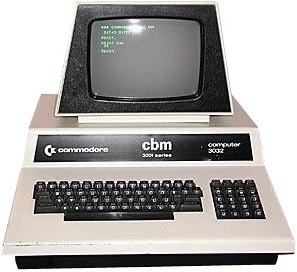 The range was rebranded CBM (Commodore Business Machine), as PET was dropped. The 3xxx series introduced the 3000 series ROM sets, BASIC v3, and a completely redesigned keyboard layout, which used a full typewriter keyboard instead of the "mickey mouse" keyboard of the PET, and dropped the on-board cassette unit. see more Commodore PET 30xx Ebay auctions !